Hairdresser Burnt Scalp Injury Bleach / Hair Dye – How Much Compensation Can I Claim? Have you suffered a burnt scalp injury at a hairdressers? You could be entitled to make a claim for compensation. We can provide the legal services you need. Many people enjoy regular trips to their local hairdressers. It can be a real treat for some people and an enjoyable experience. Unfortunately, a burnt scalp injury can quickly turn the enjoyable experience into a nightmare. A burnt scalp can be caused by bleach, hair dye, hair dryers, curling irons and straightening irons. With so much potential for burns in a hairdressers it’s important to make sure your hairdresser is professionally qualified with sufficient experience. According to the National Hairdressers Federation, there are an estimated 40 000 hairdressing salons in the UK. While many hair salons operate in a professional manner and take care when colouring hair or using heat-styling tools, not every hairdresser is equal in their knowledge, abilities and consideration for their clients. If you visit a hairdresser with very limited experience, or one that does not follow the correct safety procedures, you may end up suffering a burnt scalp injury. If you have suffered a burnt scalp injury at the hands of a hairdresser, Legal Expert is here to help you. We will expertly guide you through the process of making a burnt scalp compensation claim and provide you with a no win, no fee compensation claim service. What Is A Burnt Scalp Injury? The Hairdresser Burnt My Scalp With Bleach Can I Claim? The Hairdresser Burnt My Scalp With Hair Dye Can I Claim? The Hairdresser Burnt My Scalp With A Hair dryer Can I Claim? What Should I Do If My Hairdresser Burnt My Scalp? What Type Of Compensation Could I get For A Burnt Scalp Injury? How Much Compensation Can I Get For Bleach Burnt Scalp Claims? Why Choose Us For Your Burnt Scalp Injury Compensation Claim? A burnt scalp injury caused by a hairdresser can be a result of several different incidences. The most common causes of burned scalps are bleach and hair dye. Using bleach so close to your scalp is dangerous as it will leave a chemical burn. Rubbing bleach into your scalp is the worst thing your hairdresser can do for you. Rubbing bleach into the scalp is extremely dangerous and unprofessional and will more than likely cause chemical burns. If you see him or her doing this, do not be afraid to speak up and ask them to stop. Chemical burns can be both minor and severe. In severe cases the burns can lead to permanent hair loss and the need for a skin graft which is an unpleasant surgical procedure where skin is removed from one area of your body, usually the thigh, and attached to the badly burned area. A severe allergic reaction to hair dye can be equally, if not more dangerous than rubbing bleach into your scalp. Some serious reactions can lead to death, in the same way someone with a serious nut allergy may die from consuming nuts. Other notable causes of burns at a hairdressers are burns caused by heat-styling tools such as hair dryers, curling irons and straightening irons. Straightening and curling irons commonly rise up to 220-240 degrees Celsius. If one of these touches your face or scalp, it will lead to a burnt scalp injury and it will almost definitely leave a scar. Suffering a burnt scalp injury can be devastating. Burns are painful, unsightly and can cause permanent scarring and hair loss is the burn is on your scalp. There have been numerous cases of individuals receiving compensation after suffering a burnt scalp injury at a hair salon. In 2012 a young woman received £20,000 in compensation after suffering chemical burns from a hair salon. The young woman, just eighteen at the time, was having highlights put in her hair through the use of foils, a service that many people get done regularly. She ultimately suffered extensive burns at the back of her head and hair loss. She also had to go through the painful process of a skin graft and required Cognitive Behavioural therapy. The above example is just one of many burnt scalp injury claims in the UK. There are countless more cases that reflect the dangers of using chemicals and hot tools on your hair, whether you are doing it yourself or going to a professional salon. Section 3 of the Health And Safety At Work Act requires hairdressers to give new clients a patch test at least 48 hours before colouring or bleaching hair. The law applies even if the client has previously dyed their hair, because chemical reactions can be unpredictable. Different hair dye products can contain different ingredients. Should a hair salon fail to perform a patch test, they will be liable to pay a fine, in addition to paying compensation to any clients that suffer burn injuries as a result of their negligence. Hair can be fragile, particularly if you dye or bleach it regularly. Damaged hair will be very dry and break or snap off easily, particularly when brushing it. Unfortunately, burns are much more serious for your hair than just drying it out. In addition to being very painful, burns can damage hair follicles which may can result in severe hair loss. It unlikely your hair will grow back after a burnt scalp injury if your hair follicles have been damaged. You should seek medical advice if you have any of the above burn symptoms after a burnt scalp injury. In this guide we take an in-depth look at the types of burn injuries you could suffer, possible causes for these injuries and we will advise you on how to proceed with your burnt scalp injury claim. You will find useful information of how to treat your burns and give you an idea of how much compensation you could potentially claim. For those who have suffered from a burnt scalp bleach is a common cause. Hairdressers use dangerous chemicals to bleach hair, a service that clients often request. Most people would consider professional bleaching to be a safer alternative to doing it themselves at home. Clients trust that their hairdressers can provide bleaching services safely, with no nasty side effects or a burnt scalp injury. A burnt scalp injury from chemical burns is really very dangerous. A bad chemical burn can cause blisters, swelling of the face and permanent hair loss as it burns your hair follicles. It is a condition that will likely need medical attention and possibly even skin grafts. The NHS recommends going to a hospital Accident And Emergency department for all chemical burns and describes them as “more serious burns”. This information should emphasise the severity of suffering a burnt scalp bleach injury. If your hairdresser has given you a burnt scalp injury, seek medical advice straight away. Take photographs of the injury and call us for free advice and a consultation. We will be happy to advise you further about your burnt scalp compensation claim. Some people suffer from an allergic reaction to hair dye, which can cause a painful burnt scalp injury. A common type of allergic reaction is known as contact dermatitis which causes red, dry and burning skin. Hair dyes contain an allergen called paraphenylenediamine (PPD). PPD can cause allergic reactions ranging from minor to very severe. The reactions can sometimes take days to present themselves which is why it is so important to test a small area of skin with the hair dye at least 48 hours prior to dying your hair. Swelling of the lips, eyes, hands and feet. If you are in a hair dressers and experience the symptoms of anaphylactic shock while having your hair dyed, you dial for an ambulance straight away and tell your hairdresser to wash the dye out. It is a potentially life threatening allergic reaction which requires immediate medical attention. Many individuals use hair dryers on a daily basis in households across the UK. We rarely give a second thought to the types of burns that a hair dryer can give us. The scalp can burn at temperatures above 60 degrees Celsius and most hair dryers are capable of producing heat much hotter than this. 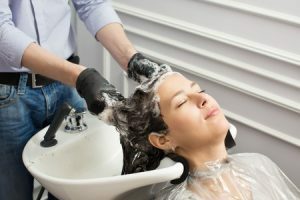 Since many of us do it every day, you would think that all professional hair dressers would know how to safely dry hair, without causing a burnt scalp injury. Although a professional should know the correct and safest temperature for drying hair, they do not always apply their knowledge to their work. There could be instances where your hairdresser is rushing. They may need to make time for their next client, so they turn the heat up to dry your hair quicker. A hairdresser could also carelessly leave the dryer blowing on one spot of your head for too long, which could cause a burnt scalp injury. Another consideration that a professional hairdresser should be aware of is that the barrel of the hair dryer can get very hot, and stays hot for some time after switching the appliance off. Should your hairdresser not be paying attention to what they are doing, they could touch your head with the hot barrel of the hair dryer, and cause a burnt scalp injury. By order of the Provision And Use Of Work Equipment Regulations Act Of 1998, Hair dryers and other electrical appliances must be regularly tested. They should be tested and maintained for the safety of their clients and their staff to minimise cases such as a burnt scalp injury. An individual should never have to suffer hair dryer burns at a hair salon. It shouldn’t happen, but it does. If a hairdresser is negligent enough to cause a burn from simply drying a client’s hair, imagine the damage they could do with bleach, hair dye, or other heat-styling tools such as a curling iron. It is unacceptable and very unprofessional. Although some of the symptoms are the same, namely red and sore skin, it is important to note that there is a difference between a chemical burn and an allergic reaction. Anyone can get a chemical burn from hair dye or bleach if it comes into contact with their skin,. Some people are more sensitive to bleach than others and are therefore more likely to suffer from a bleach burnt scalp. Someone who suffers from an allergic reaction will be allergic to one or more of the ingredients in the product and therefore suffer an allergic reaction to it. You should seek medical advice after suffering a burnt scalp injury. Whether or not you seek it immediately and treat it as an emergency depends on the severity of your burns and your symptoms. The NHS advise to seek immediate medical treatment for all chemical burns, which can be caused by hair bleach and hair dye. They also emphasise the need for immediate medical treatment if you have an allergic reaction to hair dye known as anaphylactic shock. For milder allergic reaction symptoms that are not considered an emergency you can use the treatments listed above. You can then make an appointment to see your GP as soon as it’s possible so that you may get your burns or allergic reaction diagnosed professionally along with any other recommendations for treatment. Take note of when you noticed the symptoms. If they began at the hair salon, did you say anything? How did the hairdresser respond after you did? After you have received your prognosis and treatments, taken your photographs and written your notes, your next course of action should be to seek legal advice. Legal Expert are here to help you. Give us a call and we will give you a free initial consultation. Victims with private health care will be able to recover their medical costs for a burnt scalp injury from their compensation claim. Medical expenses also cover any equipment or medication that the victim has needed as a result of their burnt scalp injury, as well as any possible future expenses. Pain and suffering is highly probable after suffering a burnt scalp injury. The specific amount you are able to claim will depend on the degree of pain and suffering you have experienced or are still experiencing. Loss of earnings from being unable to work is common after a burnt scalp injury. You can claim your earnings back with your compensation claim as well as any future loss of earnings. It includes any time needed off work for medical treatments. You can claim compensation for the damage a hairdresser has inflicted on your hair and scalp. You can claim for both temporary and permanent hair loss. Losing your hair will be very traumatic and you could lose your self confidence along with it. Psychological damages include depression, Post Traumatic Stress Disorder, anxiety and vulnerability. No one should suffer as a result of a hairdresser’s carelessness and negligence. Claiming compensation for a burnt scalp injury is your entitlement and will help stop the hairdresser from inflicting any more pain on other potential victims. A court will take a number of factors into consideration when you make a claim for a bleach burnt scalp. They will consider all of the damages, losses and pain you have suffered and for how long. A court will factor in whether the damages are temporary or permanent. They will also consider how much treatment you have needed and are likely to need in the future. To help give you an idea of how much compensation you may be eligible for, please take a look at the table below. Minor burn injury £1,000 - £2,989 Minor burns and scolds to the body that only affect a small area. Moderate burn injury £2,898 - £19,250 Moderate burn can range from small area exposure to a medium area however burns may leave prominent scarring. Minor scarring payout £1,750 -£5,700 Visible scar or several small scars only just noticeable. Visible scarring £5,700 - £16,550 Noticeable scar that is within the area of back, leg or arm. Scarring due to thermal or non-thermal heat or chemical This can range dramatically depending on how severe and where placed up on the body. This table is a rough guide. We will be able to give you a more specific figure once we have discussed all of the claim aspects with you. Please call us today for your free advice. We provide a no win, no fee service for all of our clients. The beauty of no win, no fee compensation claims is that anyone can make one, regardless of their financial situation. No win, no fee claims, also known as Conditioning Fee Agreements (CFA’s), are unique in that clients pay no upfront legal costs for their burnt scalp injury compensation claims. You will provide your expert solicitor with the information he or she needs during your free initial consultation. Then the solicitor will pursue your case, keeping you in involved as much as possible. We will bill you for the legal fees after the courts have awarded you with your claim. In the event that you don’t win your compensation, you wont be liable to pay any legal fees to your solicitor for pursuing your claim. If you don’t win, you don’t pay, it’s that simple. We are experienced, professional solicitors with our clients’ well-being in mind. Although cases such as suffering a burnt scalp injury shouldn’t happen, they do happen. If you have suffered as a result of a burnt scalp injury, Legal Expert will be here for you and support you throughout your claim. Our no win, no fee policy makes the compensation claim process so much simpler for you as our client. Our policy allows you the freedom to claim the compensation you are entitled to without having the stress and worry of the financial burdens that come with legal cases. Even our initial consultations are free of charge, where one of our expert solicitors will be able to give you valuable advise as to what you can expect from the court process. Our independent medical examinations are included in our no win, no fee policy. A medical examination is essential for making a compensation claim for a burnt scalp injury and it will greatly help your case. We will advise you, pursue your case and fight on your behalf to get you the compensation you deserve for your burnt scalp injury. With our team of expert solicitors, our free consultation and our no win, no fee policy, you really have no reason to delay calling us. Let us help you get your burnt scalp injury compensation today. Call us on 0800 073 8804 and one of our friendly solicitors will be glad to assist you. Read more about our no win, no fee policy. This Legal Expert page covers different amounts of hairdresser injury compensation claims that you can claim for. The NHS give useful practical advice and information about reactions to hair dyes. The NHS give advice about what to do if you have suffered a burn or a scald. The HSE has some advice for hairdresser’s to protect their own skin while working. The HSE with important information on health and safety in the salon.